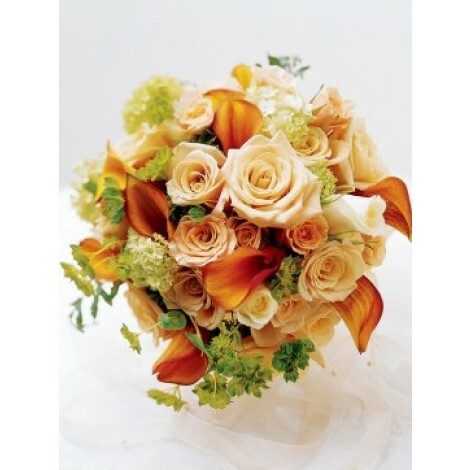 Sweet Peach Rose & Calla Lily Bridal Bouquet. 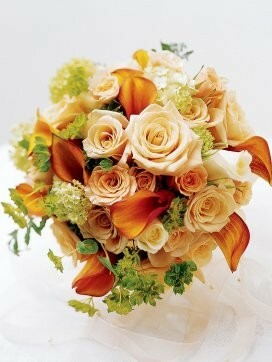 This lavish large-headed bridal bouquet is a splendor of pale peach, cinnamon, champagne and cream! The beauty and grandeur of this outstanding selection is seductively sumptuous with an array of rich, warm colours and a variety of textures. The graceful, exotic lines and sweet scents of the Calla lily make this a bridal bouquet that appeals to all the senses and catches everyone's eye! 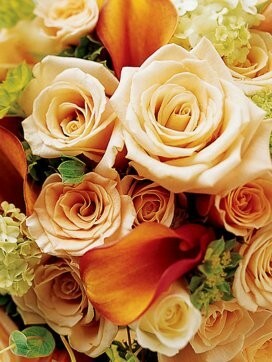 Featuring; 11 champagne large-headed roses, 11 cinnamon mini calla lilies, 7 viburnum stems, 6 peach Sweetheart roses, 5 pale peach large-headed roses and 4 cream large-headed roses with bupleurum. All perfectly finished off with trimmed ivory ribbon and cream cord.